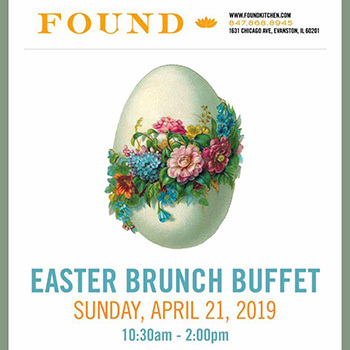 Found is hosting an Easter brunch buffet from 10:30am to 2:00pm. $39 per person, $18 per kids under 12 and complimentary for kids 5 and under. Beverages, tax and tip not included. Admission Fee Adults (12+): $39/person; Kids (6-11): $18/person; Kids (5 and under): Complimentary.